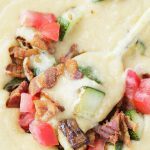 This slow cooker summer chowder uses the slow cooker to transform late summer corn into a rich and velvety chowder, topped off with bacon, zucchini and fresh tomato. 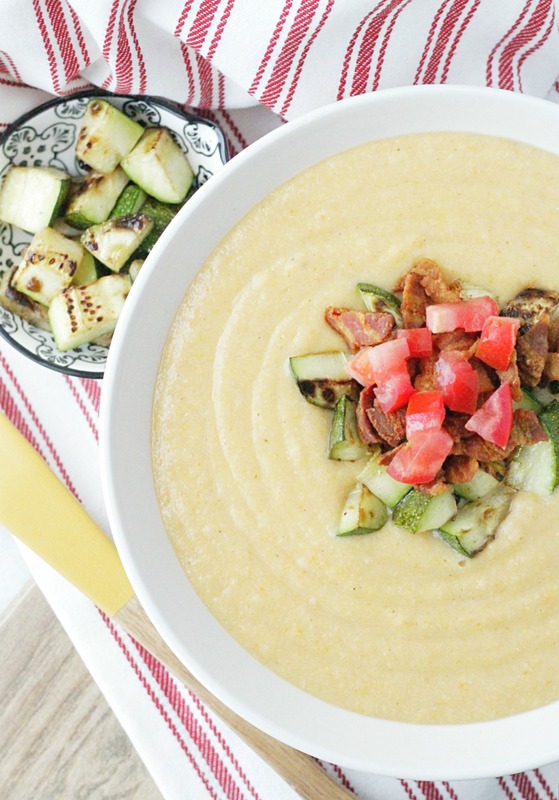 Slow Cooker Summer Chowder is for when you have a bumper crop of late summer corn, tomatoes and zucchini hanging around but you’re excited for fall and ready for slow cooked comfort food. It is summer in a bowl! This chowder is so simple to throw together. Simply chop up some potatoes and add them to your slow cooker with fresh corn cut off the cob (canned or frozen corn works well too if you are making this when fresh corn is not available) some chopped onion, vegetable broth and a few seasonings. Once everything is nice a tender, puree the chowder with some sour cream for extra creaminess and flavor. Then cook some bacon and zucchini together as a topper for the chowder along with some fresh chopped tomato and basil. Everyone will gobble it right up! This recipe makes a big batch of chowder. So plan on serving a crowd or having lots of leftovers. I personally am a fan of leftovers because this chowder is delicious reheated and served for lunch. 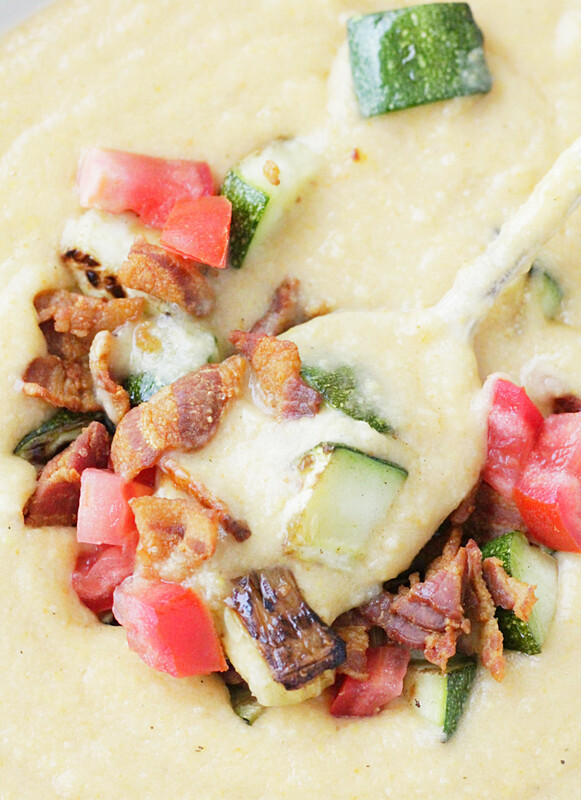 Instead of the bacon and zucchini topping you could just serve the chowder plain alongside a BLT sandwich. Or with grilled cheese. I’m getting hungry just thinking about it. 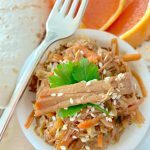 Use a 6 or 8 quart size slow cooker for making this recipe. Use an immersion blender to blend the chowder. You can also transfer the chowder in small batches to a standard blender – just be careful with the steam! You don’t want your blender to blow up. I prefer an immersion blender because you can blend the chowder right in the slow cooker. For cutting corn off the cob, this corn peeler works well. Set your slow cooker on low and add the vegetable stock, corn, potatoes, carrot, onion, salt and thyme. Cook on low setting for 6 – 8 hours. Once cooked, stir in the sour cream and blend the soup with an immersion blender. No need to turn off the slow cooker or remove the soup, just blend it right in the pot, with the immersion blender. Meanwhile, heat a large non-stick skillet over medium heat. Chop the bacon and cook until crisp. Drain on paper towels. Pour off all but 1 tablespoon of bacon fat from the pan. Return the pan to medium heat and add the zucchini. Cook, stirring occasionally for 7 – 8 minutes, until beginning to soften. 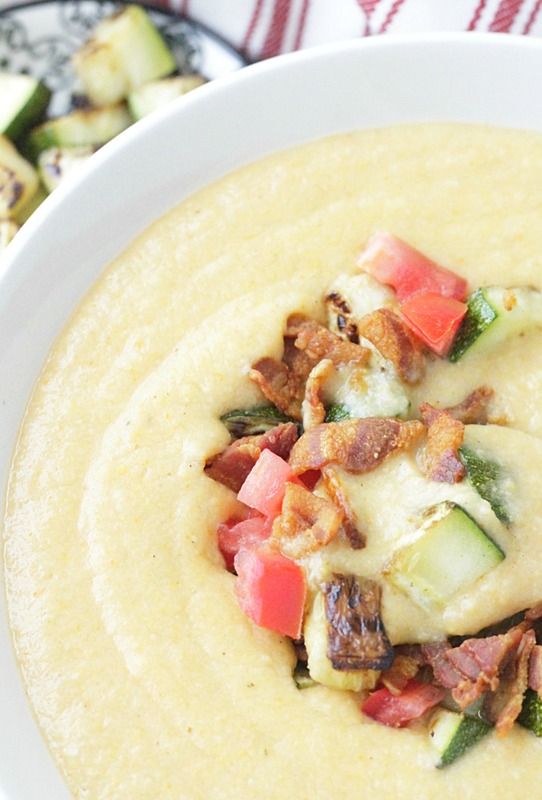 Stir the zucchini into the soup in the slow cooker. 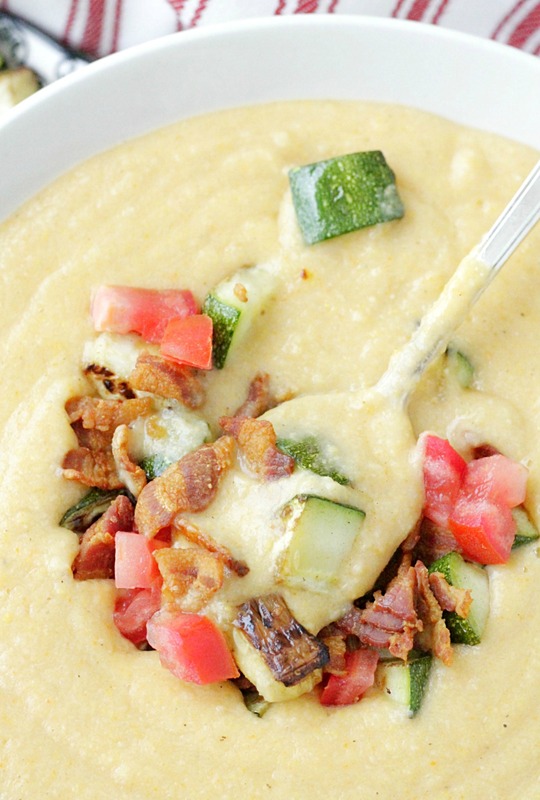 Serve the soup topped with fresh chopped tomato, basil and bacon. Getting a new phone is always so exciting!! So much of blogging can be done on those iPhones on the go. Don’t forget to get the wordpress app lol!! 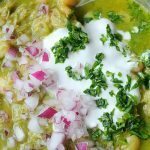 I love how this soup is made in the crockpot! I’m really glad you mentioned that Zainab because I wouldn’t even have thought of it! My old phones just didn’t do much, so I’m excited to see what all I CAN do with the blog on the iPhone! The summer chowder looks amazing. Definitely one I am pinning for later. Have a wonderful weekend. Such a fresh, summer chowder – love it! Your pictures are beautiful, Jill. This is one to share with everyone. Thanks for a great recipe! You are so kind Robyn, your comments made my day 🙂 Thanks! This is such a perfect recipe for summer! I can’t wait to give it a try (pinning of course). Congrats on the new phone! I’m late to the party here, but I have to say that this soup is INCREDIBLE. My husband, the king of “I don’t care what we have for dinner, make what you want”, requested this 3 times in a week when I first made it last year. 🙂 This is now a summer staple in our house. Making it again (stovetop, not slow cooker though) at this very moment. Thanks!! That is so great to hear. 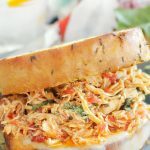 I’m so glad you like the recipe Kelly! I don’t have an immersion blender. What “mixing” alternative do you recommend? Thanks! You’d need to blend the soup in batches in a standing blender. Don’t fill the blender too full – the hot soup can cause the lid to explode off the top!